Screw the Vacutainer needle onto the needle holder. Insert the Vacutainer tube into the other end of the needle holder until the stopper touches the back portion of the needle. Do not puncture the stopper. Hold these assembled materials in one hand. 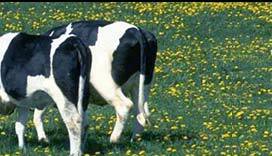 Lift the cow's tail with the other hand. Insert the needle about Â‡ inch deep and perpendicular to the tail at the under side, midline and at about 3 to 6 inches from the base of the tail. In this region, there is a longitudinal, midline ridge of skin through which you push the needle. 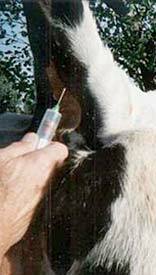 Blood will appear at the junction of the stopper and the back portion of the needle once the vein is punctured. If it does not appear, pull the needle out slightly and insert in a different direction until the vein is punctured. Once blood is seen, push the tube onto the needle. Be sure to keep the needle under the skin since vacuum will be lost if not. The vacuum will pull blood into the tube and if lost, blood cannot be collected. Use a second tube if this happens. Collect 2 cc or more of blood. Withdraw the needle from the skin and remove the tube from the tube holder. Label the tube with the animal identification. Place the tube in an ice rack or refrigerator until shipment. Discard the needle into a "sharps" container and re-use the needle holder. Use a new needle for each cow. Learn how you can adopt this and other exciting NEW TECHNOLOGIES to increase your herd's profitability through improved reproductive management. Call us at (715) 653-2201 or email us for more information. ASK US ABOUT OUR NEW CLIENT DISCOUNTS!!! 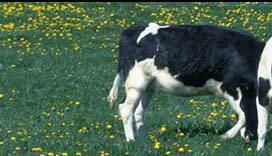 Copyright © Advanced Dairy Diagnostic Services, LLC. All rights reserved.